The UK Rhino Charge is the the 'little' brother of the unique event held in Kenya to raise funds for the protection of Rhinos in particular and general wildlife conservation. First held in the UK in 1997 it has been run annually (with one year out because of foot and mouth restrictions). Now firmly ensconced at Pippingford Park in East Sussex this years gentle cchallenge within this most beautiful of places will take place Sunday October the 3rd. For full details and entry forms you can do no better than go to the Rhino Ark website at the following address. 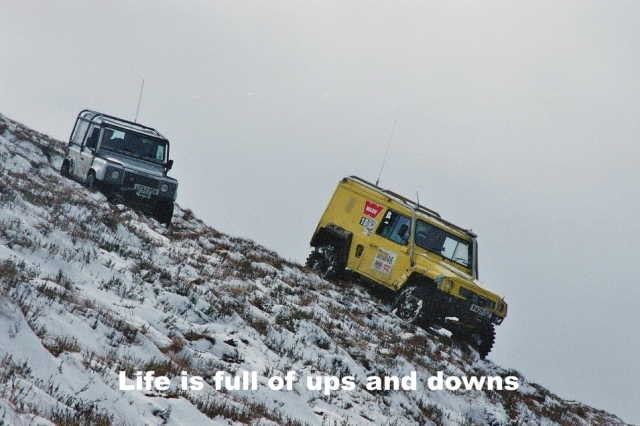 This is one fun 4x4 event that truly is suitable for all types of 4x4. (Don't take too much notice of the many videos on U tube. These are invariably of the 'after' event frolics where those with a will to do so can let off steam on one specially chosen (by me it has to admitted) particularly sadistic section for the entertainment of the spectators. The event proper is a far more circumspect affair! Parkwood is a renowned off road site in the fair county of Yorkshire with a long and illustrious history for all types of 4x4 events, training and testing. The redoubtable Rebbecca of Parkwood has been asked on many occasions for a winch challenge event for her regulars and has, in her infinite wisdom, asked Club Off road to provide just such an event. It is my intention to offer a classic CoR event. It is designed for solo vehicles with a crew of two and will be aiming to find the very best crew (please note a crew is two people minimum age 16) with a good 4x4. That also means there will be rules and regulations to abide by and draconian penalties for those who find difficulty with that simple philosophy. There will be marshalled off road tasks plus punches though the over riding concern will be to ensure that the event is testing but not intrinsically motor breaking (though as always the nut behind the wheel has the final say on that matter!) There will also be some navigation test where all crews need a compass and the knowledge of how to use it (GPS is not required). There will be no overtly physical tasks (i.e. where physical strength or stamina is bound to create a healthy lead) though naturally a challenge event does require a certain amount of physical endurance. Winching. 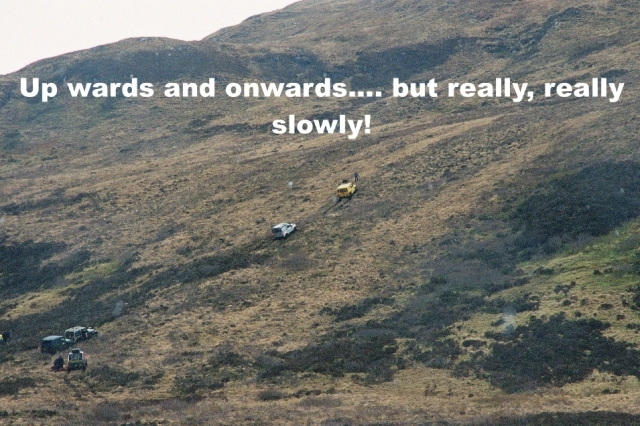 Mental agility.Precision off road driving, (there thats just made you wince hasnt it?) All scoring will be explained in writing. Your score will be given on completion of each task. (Navigation tasks excepted). You should always attend any briefings with pen and paper at the ready in case alterations are being made. Start order will be chosen at random. Tong is an all weather site so there are no real problems there other than for personal comfort, and, like Gone With the Wind, the expression in that case is Frankly My Dear I Dont Give a Damn! There is ample parking on site for trucks and trailers, please park in signed areas only. Directions will be issued with event confirmations. Basic toilets will be available on site. 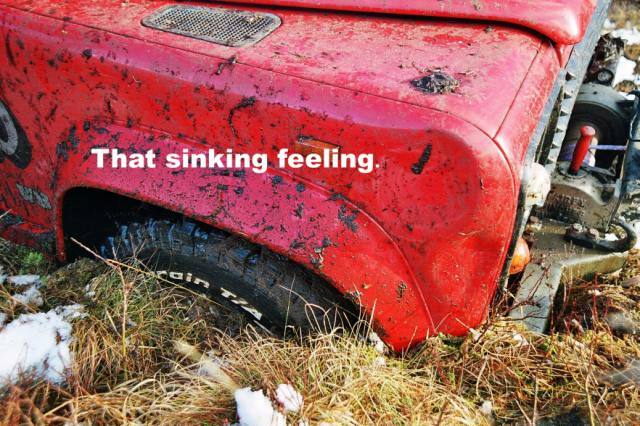 Novice crews should have no fear of entering this event PROVIDING they are already an experienced off road driver and can use a winch safely and properly. As dark nights are upon us in October start time will be 0930 and finish 1530 giving you 6 hours of fairly intensive off road action to prove yourself, your car and your co pilot. On to the devil in the detail. The classification system, winch and tyre rules are all designed to provide a simple, easily policed method of providing a level playing field. Please keep that concept in mind when reading them. Over and above what is written please understand that I reserve the right to penalise anything that I believe goes against the spirit of fair play or has an unfair advantage. If you have an unusual wizard gizmo or gadget then talk with me before you fit it and save possible grief later. Club Off Road is a benign dictatorship. Any protests will be heard and judged objectively & sympathetically but the final decision is just that, final. Entrants must accept tasks as they are presented and according to the rules given. Classes. All makes and types of road legal, (that means taxed, tested where applicable, and insured) light 4x4's. NOTE. You will need to show; a valid driving licence for any intended driver, a current test certificate & tax disc for the entry vehicle at the event. Specifically banned are the following; portal axles, hydra steer, 4 wheel steering, tyres larger or more aggressive than the sizes specified below, quad bikes. All vehicles need to have proper metal bodywork enclosing the cab area OR a roll cage. Standards Class. Only one winch. No axle diff locks or other traction aids including electronic traction control (ETC, if fitted as the factory standard is acceptable unless it also activates differential locks whence it reverts to special) or any form of fiddle brakes. Tyres no more aggressive than Mud Terrain pattern (Diamonds etc are classed as no more aggressive, Simex or copies are) no bigger than 32 tall and 11 wide. A vehicle fitted as standard with a REAR limited slip diff (Trooper, Shogun come to mind) remains classed as standard, fitted with two limited slip diffs, whether standard fit or not, is classed as a special. All Standard class entries will be checked to ensure compliance with the foregoing before the event. In the event of non compliance specials classification will be used. Specials Class. Anything not in standards class plus tyres no more aggressive than Simex (no Maxi Cross, Sataniks Implement pattern etc) and no bigger than 36 tall 13 wide. All tyre sizes will be measured with the CoR Read it and weep gauge - not the sizings on the tyre wall. cancel the event with a full refund of all money, maximum entry 25. Cheques must be sent with the entry but wont be cashed until the minimum entry is reached and not earlier than October 1st. Confirmations wont come out till October 2nd but if you have an e mail address on the entry form then you will be notified by E mail as soon as the minimum is reached and the event confirmed. Whilst spectators are not allowed there is some discretion for those who want to bring people with them, all I ask is that they let me know their names and keep numbers to a minimum, visitor passes will be issued to notified guests. To try and keep costs down we intend doing virtually all communication by e mail so please ensure your e mail address is correct and current. For an entry form please e mail brian@cluboffroad.co.uk to receive the downloadable (full colour!) version of the regs and entry form to you. The Highland Enduro. Kyle of Lochalsh, Scotland. First an explanation. It is entirely my fault that this event happens a week before the Muddy Truckers, and I am deeply distressed by it. Originally destined to be two events in one it has now metamorphosed into two separate events utilising the same site. This has been done mainly to try and ensure that the small number of gloriously hardy band of challenge entrants who may want to do both don't have to choose between two events or indeed try and do both with a tiny gap between, and partly that I realised I must have been having a senior moment when believing that these two events could have been run side by side in the clutches of the Kyle. The medicine is now working! The Muddy Truckers is a top flight challenge event with a golden hearted centre in its aims and provenance. Hopefully the Ironman Enduro challenge event listed below will be of a similar stature (and not clash with another event that I am aware of)! Back to this, truly unique, event, The Highland Enduro. The Enduro is NOT a challenge event. It continues to be the only one of its kind in this many sceptred isle and was first held in 1996 near Inverness. It is freestyle. Unfettered by limitations as to route, direction or method within the actual boundaries of this huge area and the acceptance that there is only one entrance and exit. There are limitations on entrants but they are light. ALL vehicles must be road legal at the time of entering. Taxed and tested (where applicable) and insured for road use. Tyre size regulations do not apply, but limitations as to tread do. (i.e. no dumper or implement tyres, maxi cross or sataniks) Terra tyres are acceptable. All vehicles MUST, AS A MINIMUM; be in obvious good mechanical condition for the event and prepared for sub zero temperatures. Have at least one working powered winch. Towing points front and rear. One ground anchor. First Aid kit. One shovel. Enough fuel for three day off road (Experience with Land Rovers says that a tank full, 10/11gls, is OK for diesels and usually just enough for V8's too though a 5 gallon back up would be needed for real confidence with the latter. 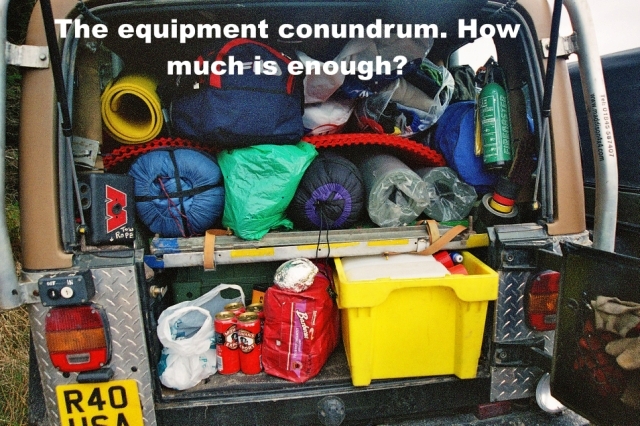 Have enough equipment, food, water and clothing to sustain the crew for three days. The Enduro can be tackled solo or as a group of vehicles of whatever size you choose. However if done solo then there must be a crew of 2 minimum for that vehicle. Groups need a minimum of 3 crew for 2 cars and never less than a 75% ratio of people to cars whilst bearing in mind that it is my considered opinion that each vehicle really needs a crew of two. There can be no more people in any vehicle or group of vehicles than there are seats available and note that NO spectators are allowed, there is crew, nothing else. 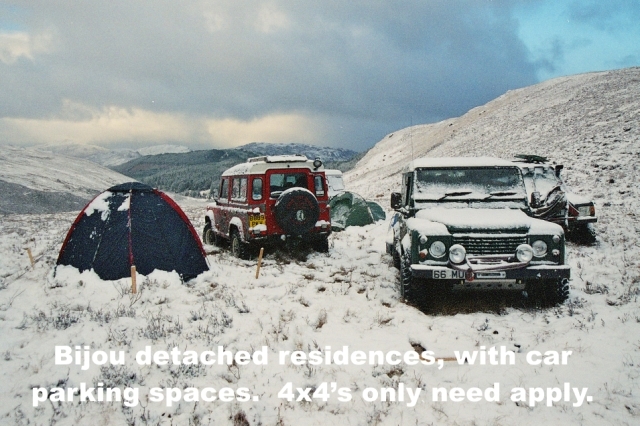 Do not rely on finding another 4x4 to pair up with on the day organise that beforehand or be prepared to go solo. Be prepared to commit to hauling out everything you take in, digging latrines of a minimum of 18" and backfilling after use. Advised. Waffles or similar, closing tent flaps when snowing hard. Maps of the site are provided to entrants. As I write this the Skye Bridge is closed to high sided vehicles and CalMac ferries are all in port due to storm force winds and torrential rain on the West Coast. Once previously the event had to be postponed as the track to the site was completely blocked by wind-blown trees. We have had snow, ice and high winds. Last event a well experienced group chose to descend a steep hillside in the pitch dark rather than camp at the higher level due to the winds and cold. All this and possibly more is part and parcel of this event, and don't forget actually getting to the Kyle. A serious mechanical defect could, repeat could, see your vehicle having to be left on site, there are no chicken runs or short cuts here. The way out is as hard as the way in and some scenarios would mean that no amount of effort could recover a totally dead motor. On that point it is part of the conditions of entry that everyone accepts they may be called upon to help a fellow entrant in distress, like the rules of the sea we help each other because there is no one else to help. Not medically (very basic first aid only on site and professional services, once contacted, could only get as far as the gate before resorting to walking) not mechanically (Who ya gonna call? Ghost Busters?) and trust me when I tell you that Tesco's don't deliver. Mobile phone coverage is patchy and available only at higher altitude on the 2 major networks. Excellent! On the plus side, weather permitting there are stunning views out to Loch Carron and Skye from the 1300 foot highest reaches and this is a rare chance to indulge in some heavy freestyle off roading amongst other 4x4 enthusiasts with a real taste for adventure. All entrants who manage at least 48 hours of the event will receive a CoR vehicle plaque acknowledging their achievement. If you have got so far and are actively thinking of your equipment needs, food etc. then it is a safe bet you are interested. If any of the above makes you feel nervous then it's better to just send off to Club Off Road for the professional DVD of our first ever Enduro on this site (£12 inc. P&P, cheques or PO's made payable to Club Off Road) watch it in the comfort of your own home, or better still sit in your 4x4 and watch it through the window, and dream. It's equally valid, a lot safer, infinitely cheaper but nowhere near as satisfying as the real thing. Likewise if you have never entered this event and would like a full colour, full frontal, foretaste then get the DVD. The event is open to any make of light, road legal 4x4 vehicle BUT CoR (i.e me) reserves the right to refuse any entry not up to the standard required for this event. Land Rover Nineties and derivatives make up the majority of entries with Ibex, Suzuki SJ's, Jimny's and Jeep Wranglers being equally successful if numerically smaller. We have also had Troopers, G Wagens, Discoveries, Range Rovers and a Shogun on the Enduro. You do not need a fully specced Challenge truck to enter and enjoy this event but you do need a well prepared off roader and the basic equipment. In truth no vehicle without a low ratio and decent ground clearance would be allowed to enter. If you want more graphic details and an entry form then click the link. Ironman 4x4 Enduro. Kyle of Lochalsh, Scotland. Read the Enduro details above as most of that applies to this event too. The Ironman was a new concept for us in early 2006 and it provided some soul stirring off road action as well as superb scenery. Simon Buck and Matt Cook took the classy spherical orb trophies home after a seat of the pants final days battle with James Feeny and Patrick Smart. In my humble opinion it was the hardest challenge event in terms of being continuously on the go ever held in the UK. To push the concept boundary a little further, this years Ironman will be a longer event by some 8 hours, it also needs entrants to live out of their 4x4 for the whole time. This event is not for the faint hearted, people who think their problems are someone elses fault, the poorly endowed or those who think a Travelodge is roughing it. It is exclusively for self sufficient, experienced off road drivers who enjoy the struggle against similar crews and the terrain as much as they enjoy the victory and are prepared to face defeat with resolve. Solo vehicles will have to pit themselves against whatever the West Highland weather and this typical West Highland site can throw at them over two days (and a probable third day should be factored in as getting from the finish line to the gate could easily take another half day). During this time each team will have to live entirely out of their vehicles. Anyone who enters the Ironman will need an iron constitution, the winners, in whatever class, will have earned their Ironman sobriquet the hard way. Navigation will be needed as each crew must detrmine their own route to collect the punches as their is no required order. In poor weather navigation will be paramount for both safety and for overall placings. Each entrant must be able to satisfy the following MINIMUM criteria; Road legal 4x4 to the requisite standard for the chosen class. Have a powered winch. Have a substantial ground anchor. Show enough camping equipment and vittles at the pre-event check to sustain the mandatory crew of two for three days. If you genuinely feel that you have what it takes for this event then click the link below for an entry form and more details.